See all your Tamagotchi friends in their first feature-length film! On Tamagotchi planet, Mametchi, an illustrious inventor, has just finished his new creation a Forwarding Machine. But on its first trial run, the mischievous Kuchipatchi somehow manages to throw the machine s aim off course, which results in a child from Earth, Tanpopo, being transported to the Tamagotchi Planet. While the little girl is thrilled to see her favourite Tamagotchis in person, she soon realises that she can't get home. 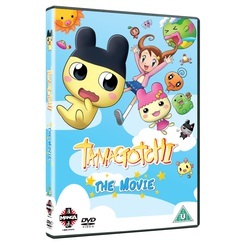 Mametchi's mum and dad assure her that they will be able to invent a rocket which will take her back to the exact time she left and so, relieved, Tanpopo manages to enjoy the time she will spend living with Mametchi on Tamagotchi Planet until she can return home. But as a series of strange events threaten the planet, Tanpopo and her friends find themselves responsible for much more than her return to Earth.